The PA20-CP are sturdy, "walk up and go" powered mixers, guaranteed to deliver loads of weighty power from their 'Constant Power' amplifiers. 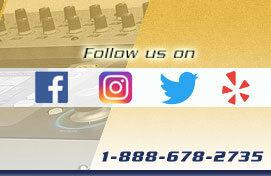 These well thought-out mixers offer operational flexibility for any live sound situation and engineers of any experience. Mono Inputs, 16 mono channels with Mic [XLR] & Line [TRS] inputs. Line input overrides the XLR input. Individual +48V phantom power switches are provided. New padless two-stage preamp with smooth gain law. Line input goes to second stage for better matching and performance. Switched 100Hz high pass filter. Insert point. 4 band EQ. 4 aux mixes. Mute with LED. PFL button with LED [functions as peak indicator]. 100mm fader. Dual Stereo Channels, Two stereo channels with two unbalanced stereo inputs on each. One is RCA one is TRS jack. Independent gain controls provide source mixing in the channel strip. The top inputs [RCA] can be switched direct to L&R instead of the channel strip providing extra returns. Two band shelving EQ. 4 aux mixes. Stereo balance, mute with LED, PFL with LED, and 100mm fader as mono channels. Constant Power Amplifiers, 1kW i.e. 2 x 500W RMS peak power professional class AB power amplifiers built in. Unique ALLEN&HEATH design gives full output into 4 OR 8 ohms [rear switch selector]. Output is to locking Speakon™ connectors. Thermal management twin fan system. Full protection - input limiter to prevent clipping, short circuit protection, current limit and DC fault sensing. LED indication of: signal presence, peak warning, speaker protect and temperature. AB amp input TRS break-jacks [normalised to output section / slave out jacks] allow independent use of the power amplifiers if desired. Standby mode switch puts amplifier into protect with speakers isolated.